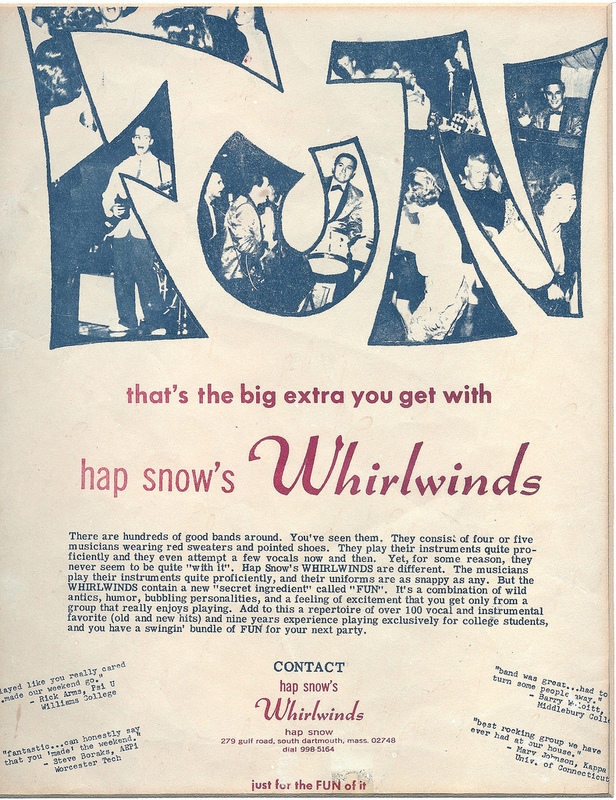 The Oo-Ee Baby: Hap Snow’s Whirlwinds Live! EP captures the band in their element, live at three New England schools: Middlebury College, Northeastern University, and Williams College. From 1958 to 1966 the band made its reputation performing at fraternities and student centers at area schools including Bowdoin College and Colby College in Maine, Amherst College, Harvard University, Northeastern University, Tufts University, and Williams College in Massachusetts, Wesleyan University, University of Connecticut, and Yale University in Connecticut, Middlebury College in Vermont, Dartmouth College in New Hampshire, and several schools in New York, among others. The opening song of this collection of unreleased tracks is from a rehearsal at Williams College in 1959. “Know What You’re Doin’ To Me (Oo-Ee Baby)” was written by and features pianist Art Bearon on vocals. 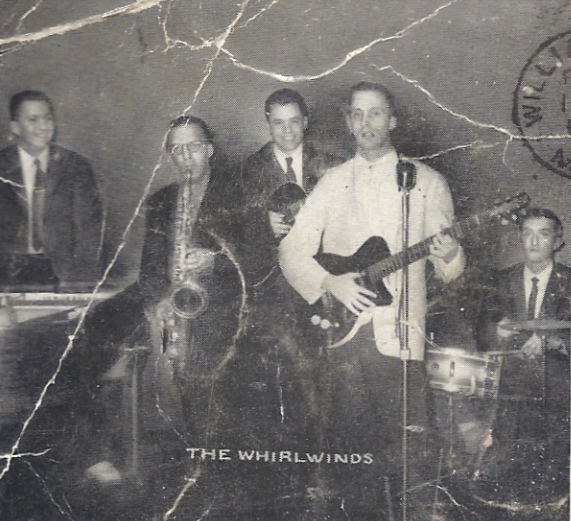 This original tune, according to Hap Snow and Bearon family members, most likely predates Art’s time with the Whirlwinds, meaning the composition was written before he turned 18. Other band members on this recording include Harry Lewis on sax, Stefano Torossi on drums, and Snow on lead guitar. Two of the next three tracks are standards recorded at Middlebury College in 1959: “The Birth of the Blues” by Ray Henderson and “Blue Moon” by Richard Rodgers. “Where’s Harry?,” the middle tune, was recorded at Williams College in 1958, and also features the same musicians that play on the first four selections. The final song, “Back Again,“ was written by Steve James (aka Steve Fradkin) and cut at WNEU Studio at Northeastern University in 1964, five years later than the opening four tracks. Ron Frizzell produced the standout track which is representative of the greater emphasis on vocals in the later years of the band, often involving two- or three-part harmonies. The track features James on lead vocals and rhythm guitar, Frankie Mento (aka Frank Chiumento) on drums, Michael Kaye on keyboards and vocals, Ted Pina on bass guitar, and Snow on lead guitar and vocals. This entry was posted in Unreleased Music and tagged 50's Rock, 60's Rock, Art Bearon, Arthur Bearon, Frank Chiumento, Frankie Mento, Hap Snow's Whirlwinds, Harry Lewis, James K. Snow, Massachusetts Rock, Michael Kaye, Middlebury College, New England Rock, Northeastern University, Ron Frizzell, Stefano Torossi, Steve Fradkin, Steve James, Ted Pina, Williams College. Bookmark the permalink.